Sign-ups are closed!!! Swap Dates: May 1st - June 21st Next round: Sign ups begin June 11th. Swap begins June 26th. I got my swap Kit! How about a sneak peek! The Golden Snitch To Be Released Today! may it be for you? Quidditch and other Hogwartly Things! from my gorgeous hogwarts-sock-kit you will find here. i love everything and my pal did a glamorous job. a big THANK YOU to jenean for the idea and organisation! Here's a preview of your bag. Yours is the one on the left and the back looks like the one on the right. The one on the right is for my eldest daughter who just had to have one when she saw me making yours! Someone from Ravenclaw stole Harry's invisibility cloak!!! GASP! For a more detailed breakdown you can click the link to get to the flickr pic with all the notes, or you can go visit the post at my blog which contains more than just sock kit updates. A great big public thank you to Jennifer for being awesome and doing a really good job with this swap. 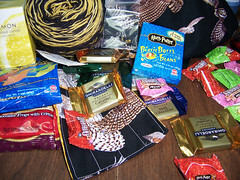 I couldn't have asked for more, and despite the fact that the exploding bon bons were a big shock when I got to the 'Exploding' center, I loved the extra goodies and I've already used them to do a couple of 2-stitch icords for my pal's bag.. which you can sneak a peek of here. Who are the two people speaking in this quote and what book is it from? 5 House Points to those who post the correct answer to their blogs. "I'm not trying to say what she did was sensible. I'm just trying to make you see how she was feeling at the time." "You should write a book, translating mad things girls do so boys can understand them." There is a new challenge up on my blog. There was a lot more interest last week, so I decided to follow the same theme. a little DPN holder just for sock needles. I like it so much I will be making one for myself next! Well I thought since others were posting some sneak peeks I would post one of my own. My package was supposed to go out in the mail on monday but some delays happend you can check my blog about the delays. but here is a pic of some of what I am sending. I think my partner will really enjoy this. I got my package today!!!!! I was totally jazzed and surprised because I’m just finishing up the bag for my partner, so I didn’t expect mine to get here yet. I am soooo jazzed. I sorted into Hufflepuff, but I’m not a huge fan of yellow. This bag that she made, though, is absolutely gorgeous!!! I love it! Yesterday, right after I let the snitch go (thank you Jenean for letting me help) I had a short amount of time before class and then... Stitch n Pitch at Dodger Stadium-- the Dodgers won! Anyhow, the night before when Jenean was looking for someone to release the snitch, I found out that she and I were both going to be at the same game! That's Jenean on the left and me on the right, with my incredibly crazy hair. :) I linked it to a larger version... if you dare! 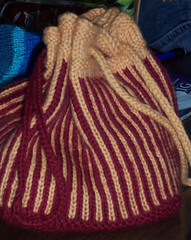 There was tons of knitting and I finally managed to get my hands on the yarn for the replacement bag for my partner (since my cat stole the other one) and some nice Gryffindor sock yarn in Trekking. Search the skies in Big Sky Country! The kit for my Hufflepuff pal is in the mail! The race is really between all three of the top Houses. Hufflepuff did find the Snitch, but had low participation in the trivia and pictures. If they had higher participation we would have seen them rise even higher. Gryffindor's participation was also rather low this time around, so it is very possible to steal 1st place by either Ravenclaw or Hufflepuff during the next and last round of Quidditch!! Be ready, ladies! The last round will take place June 10th! 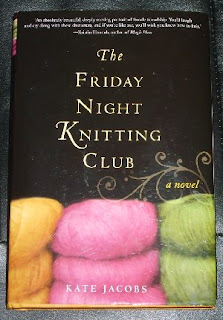 Congrats to Anne who is the winner of a new copy of Charmed Knits and a themed book marker!! You ladies are so quick!!! Here I thought that it would take a couple of hours. To determine the winner I go by the earliest time stamped email that I receive. And the winner is . . . . I will total the points for each House and display them shortly. Just wanted to remind you all that the Golden Snitch will be released sometime today. I also wanted to let you know what you'll be looking for. Send me an email when you find it - bordeaux700 AT yahoo DOT com. There is a new challenge on my blog for those under my prefectly gaze! There were only 2 entrants last week, so if you didn't please have a go. It is only a bit of fun, and I could send you a prize. The Sorting Bag! My partner is in Ravenclaw, but I wanted one thing NOT to be Ravenclaw colors. Hence the Sorting Bag. 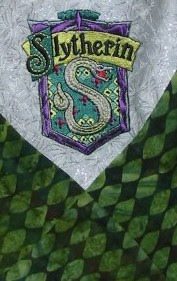 Plus he's got a look this Slytherin kinda likes! 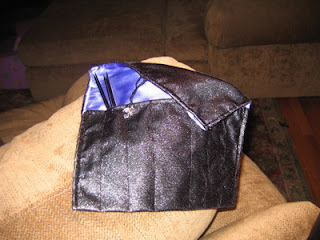 hopefully my ravenclaw pal will like it - blue & bronze are hard to find and so i choosed a fabric in blue & sandy. the flowers will be outside and inside the stripes. 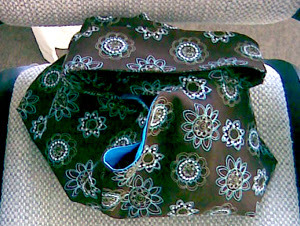 next weekend i will visit my parents and there will be also a sewing machine to finish the bag. 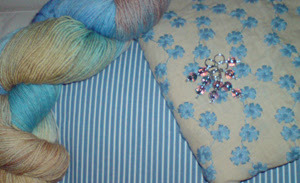 you can see also some stitchmarkers in bronze with blue and silver on the pearls as well as a hand-dyed skein sockyarn. I should have my package in the mail on Monday. 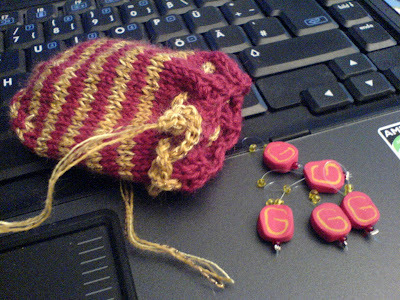 I have the yarn, Just putting the finishing touches on the bag and the stitch markers are made and ready to go. Just need to go shopping around town for some Alaskan goodies to throw in there too. I am really excited about this swap. And I cant wait for you all to see whats in the box. Ok I feel like an idoit I didn't wait for the whole screen to load to accept this invitation and yeah well anyway got my package a few days ago like two and got my yarn today from darhmafey and can't wait to send the whole package just need stitch markers and a closure for my bag now! Woot! I'm so excited.. I have everything for my spoilee ready, except the yarn, which should be arriving today or tomorrow I think! I'm pumped to get it out in the mail though as my pal lives in Alaska... and I expect it may take a bit of time to get to her... Anyone else ready to mail??? The Quidditch trivia will be posted to the site late Saturday night/early Sunday morning. The Snitch will be release on Tuesday, so that will give you two whole days to get those questions answered. Once I have found out that the Snitch has been found the trivia will be removed from the site and the points will be tallied. On the weeks that Quidditch is in session there will be no weekly trivia. Some of you may have noticed that you can sign up for FeedBlitz over to your left. With FeedBlitz you'll get daily updates when the site has been updated. You can now post here on this blog! I sent out invitations last Sunday and many of you have accepted, but there's still about 20 of you out there that have not. You don't have to, but I wanted you to be aware that the invitation in sitting in your inbox. Thanks Jenean for the invite - it came just in time for me to make an announcement. Because I changed the header to this page the weekly trivia will be located in a post :) When everyone begins posting on this blog you'll have to make sure that you look a little more closely for the trivia because it may get lost amongst the other postings. This week I will give you three trivia questions. 5 points for each question answered. Yes, the trivia gets harder as the weeks progress. What's the name of this potion? This potion has the colour of molten gold, and while exposed to the air, large drops will leap like goldfish above the surface without spilling. Which book is this line from? "Harry and Cho were now too embarrassed to look at each other, let alone talk to each other; what if Ron and Hermione started going out together, then split up? Could their friendship survive it? Harry remembered the few weeks when they had not been talking to each other in third year; he had not enjoyed trying to bridge the distance between them. And then, what if they didn't split up? What if they became like Bill and Fleur, and it became excrutiatingly embarrassing to be in their presence, so that he was shut out for good?" "Oh I am glad I'm not on duty. I wouldn't fancy having to go and tell the Irish they've got to stop celebrating." I've updated the yarn and goodies links to the left. 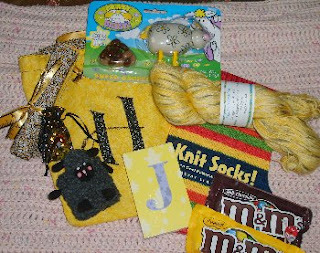 You'll find different links that sell stitch markers, buttons, and even Bertie Botts Beans!! 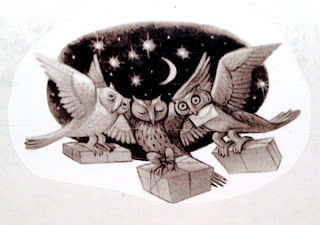 I've also included a couple of links for Owl mail - send an HP e-card to your pal! First, my aplogies. I did make a rather large post concerning the Quidditch sessions; however, I failed to refer to that post again once all the sign-up frenzy was over. I must say, though, that it went quicker than I thought it would go. Now that everyone is here and accounted for I shall attempt to explain again the rules of Quidditch. You can also find a link to your left that leads to the previous post concerning Quidditch. For the next round - The trivia questions will go up on Sunday(not this Sunday, but the 20th) and will remain up until the Snitch is found. The Snitch will be released on Wednesday of that same week. This was suggested by Laura from Ravenclaw - 10 extra points for Ravenclaw!! The Quidditch games will consist of more trivia and a little scavenger hunt. There will be two more rounds of Quidditch during this swap. For each round I will need one volunteer to hide the Golden Snitch. Of course, that means that person will not be able to play during that round, but they will have two other rounds to try their luck. In order to hide the snitch you need to have a dynamic blog, meaning that you need more than one page to your blog to make it a little harder to find the snitch. See my blog as an example. Look at the navigation to the left - Witherspoon Cabin. Each Round of Quidditch will last until the Golden Snitch is found or one week. After the Snitch is found the trivia and scavenger pic information will be removed from the site! So, be sure to get your answers up before Wednesday!! The Golden Snitch Has Been Found!!! So, sadly for some, that is the end of round one. I will post the total points earned by each house a little bit later. Congratulations goes to Gryffindor and Nala, who will be the recepient of Friday Night Knitting. I've taken total points earned and divided by total points possible for each House and these are the results! Hello! Happy Cinco de Mayo to my stateside friends! I'm excited to say that many of you are showing your House colors like true Hogwarts students. There are only about 2 that are not participating in the trivia. More on the first round of Quidditch to come! Just had to share that the prize for the winner of the first round of Quidditch arrived in the mail! Hello, ladies! Wow! It's been a while since I've done a swap and the first time with this many people :) I've done tons of smaller swaps in the past. If you stumble upon some really cute HP swap goodies, please send me the link so that I can put it here on the site. I would love to find a few more little things that I can throw in the bag. Well, there are some questions floating around out there, so I thought that I would answer some of them here. If you have a question, go ahead and leave it in the comment section and then I'll update this post with the answer. Partners - Are we sending to the same person that is sending to us? No. Most of the partnering works like a triangle, though, there are some matches that have four to five people in them. If there are 3 people in the triangle, for example, Mary will send to Beatrice and Beatrice will send to Sandy. Sandy will then send to Mary. Swap Packages - When do we need to send them? 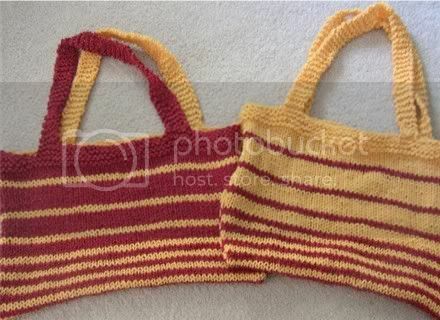 Some people will be knitting their bags, so they will need time to do that. Packages need to be sent by June 21st. That does not mean that you need to wait until then! When ever your package is complete go ahead and stick it in the mail. Quidditch Dates - When is Quidditch happening? Go here for a better explanation. Weekly Trivia - Where is it? 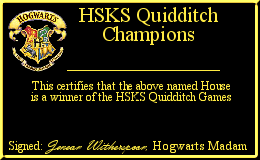 The weekly trivia question will be posted at the top of the blog right under the HSKS title on the weeks that we do not have a Quidditch session. Prefects - a few things have been shifted around, so I will be emailing you a new list. I have a few things to do tonight before my knitting meeting, so most likely you'll get a new list tomorrow. If anyone did not receive an email from me concerning your partner assignment or if any other problems arise, please contact me right away - bordeaux700 (at) yahoo (dot) com. Sign-Ups are now closed. If you've missed the deadline, but would like to join in on the second session, please visit us again at the beginning of June. We currently have 53 swappers! Yeah! If everyone keeps earning those House points I know that we'll have even more next round. Reminder to participants!! Ignore the Swap-Bot assignments that go out! I will be working out the assignments today and will send you your partners information via email. As you know, this is my first time using Swap-bot. For the next round I will be sure to do an International and U.S. only swap. To keep track of packages received so that we can update the Swap-bot points for each person, I will open up this blog for posting to those who register in a couple of weeks. Percentage Points - I asked my math genius of a husband to help me figure out how to use points & provide percentages and we figured it all out :) I will add up the points that each House is earns and divide that by the total number of points that are possible for each house in order to get my percentage. Every week I will add the cumulative points and use that same process. Points wiped clean! So, right now we are going to start with a clean slate. We'll consider the last two weeks to have been practice weeks. Now that everyone is settled into their Houses and the member numbers have stopped fluctuating, it will be much easier to keep score. That means all prefects will need to, again, count the number of logos posted, as well as the trivia for this week, and report back to me. Right, then! I'm excited! Right now, though, I have a dentist appointment that I must go to. When I get back I'll start the assignment process, so make sure to check your email box! !